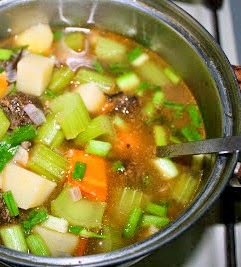 Mutton meatballs in soup. Quite a nice food thing actually. The soupy version to a mutton dish for a change (Mutton Parathal)? But not the kinda just a plain soup as an appetizer or starter before your main course. 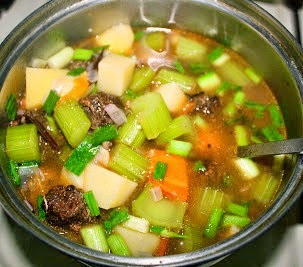 Instead, its a hearty and tummy filling soup. In fact, a one pot dish. Vegetables and meat in soup obviously. Ample enough by itself or for dipping toast while slurping in. We Indians on the other hand treat our soups as a main dish. Even this Indian Mutton Meatball Soup is poured over our rice (Indian Crab Soup) before? Our fingers are most of the time our fork and spoon to food tucking in and if your concern is, what if mutton meatball is going to have a strong mutton smell, fear not what not. Mutton meatballs mixed with ginger juice and dried rosemary I vouch will get rid of the smell. Indian Mutton Meatball Soup. Our Indian style soup delight. ** Note: keep aside 1 tbsp mutton. Mix all the ingredients, shape into small balls, fry for a light coat of crispiness outside, remove and keep aside. In heated oil, add the reserved 1 tbsp mutton, spices, cumin seeds and onion. Saute for a couple of mins over low heat. Add tomato, potato and carrot. Pour 1 liter water and season with salt. When potatoes and carrots are half cooked, add celery. Stir and simmer again to heat through. Off the heat and combine in spring onion.